Canlubang Golf Course, this south course has a precise feel to it! The Canlubang Golf Course is nestled among the rustic atmosphere of a former sugarcane plantation; it has endeared the hearts of many local golfers due to its simplicity and scale. Debuted as the largest Golf club in the country in terms of the fairway length, the Canlubang Golf and Country Club possess two Par 71 18 holes courses, the North and South Course, the creation of Robert Trent Jones Jr. Interestingly enough, the two courses couldn’t be more different. The North Course is a more masculine and demanding course, whilst the South course is more feminine, playing very differently from the North Course. Canlubang Golf Course, like most courses has three sets of tees; the Blues are the championship tees, the Whites are the members' tees and the Reds are for beginners and ladies. The South course measures from tip to tip 6785 yards. While the Robert Trent Jones Jr. design, featured an abundance of tropical foliage and ravines, the south course gently entwine up into the foothills and have some superb views of the Sierra Madres and the Laguna de Bay. Just as it’s hard to read a woman, the South course is hard to gauge. The ravines seem more menacing and wider and even the holes unfurl in spectacular manner, requiring you to take full swing over the tree and gaping ravines. If there is one shot that you will need to play well, that shot would be a good tee shot. If you ever miss the wide fairways, the hole will really play long. I guess the statement that “Hell knows no fury like a woman scorned” could describe your game accurately on the South course. 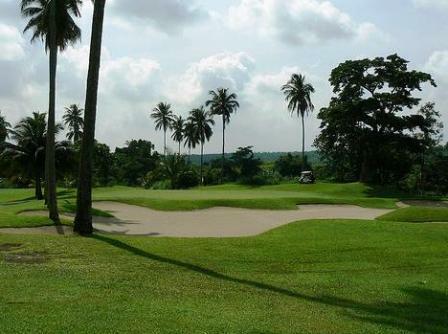 The Canlubang Golf Course is carpeted with Zoysia grass, a local species of the Bermuda and is quite coarse to putt on. The trick here is knowing where all the greens break and if you keep yourself focused, you will be able the read the green fairly quickly. Otherwise, ask your caddies! The caddies here are quite knowledgeable about the grounds so it will do you good to listen to them unless of course you happened to be stuck with a newcomer. Nevertheless, the South course is not all that unreasonable! You actually get the initial two holes to warm up on before you come face to face with a carryover a ravine. You should note, the Par 5s are reachable in two strokes for the long. The unassuming clubhouse has a driving range and putting greens, change rooms for the men and women players and a Pro shop as well. There are also Restaurants, Tee houses and a Bar to service the players’ gastronomical needs. 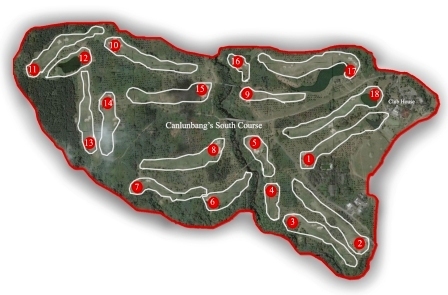 Getting to the Canlubang Golf course is quite straight forward. You need to take the South Superhighway and exit through Silanagn Exit. After the checkpoint, make a right and another right at the end of the road. When you reach the Caltex Station, turn right again and continue driving until you see the Club on your left. Drive time from Manila to the club is approximately an hour depending on the traffic. If you like a round, have a look here for some great rates and tee times. Have you played Golf at the Canlubang Golf & Country Club ? What did you think of the Golf Course? What was the easiest hole? What was the hardest hole? Any tips about playing here? Were the clubhouse facilities what you expected? Would you visit & play here again? Do you have a story, a picture, or a tip to share? Tell others about the golf game you played here. Show off your photos! 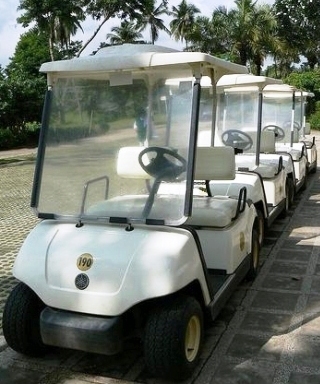 Return to Philippines Golf Courses Page.